Glass condenser columns are among the items Gary Bonomo believes could have a new use under his equipment swap program. Gary Bonomo reaches for his keychain, and unlocks a drawer in a sunsplashed room at the Life Sciences Complex. Inside is a treasure trove of glass tubes. Bonomo explains that the tubes are actually condenser columns for distillation, a common laboratory item. There are three drawers filled with the tubes, which are no longer used by the courses in the room and just sit in storage. 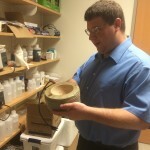 Bonomo believes those old tubes can have a new life, along with other pieces of lab equipment that are in storage or classroom drawers. According to Bonomo, “I saw an opportunity to organize the process and help the department. It’s a department I take great pride in,” he added. Lab Supervisor and General Chemistry Laboratory Instructor Gary Bonomo holds a sand bath, which is used to heat glassware evenly. And when it comes to cost savings, it all adds up. 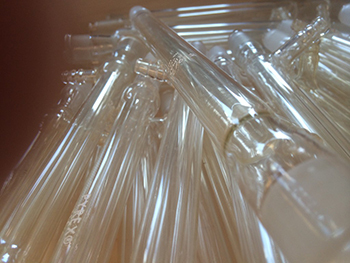 In the case of the glass distillation condenser columns, a quick check online indicates a price of about 75 dollars each. Bonomo says it’s not only glassware, but higher-end equipment that once had a useful life but is no longer needed for one particular class. An example set one column tube at a time.